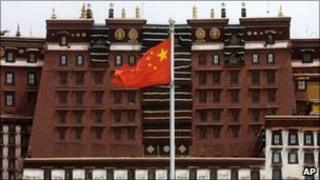 Chinese officials have announced travel restrictions to Tibet ahead of the third anniversary of riots there. The top Chinese official for Tibet said travel by foreign tourists would be limited, citing safety reasons such as overcrowding and cold weather. In March 2008, Tibet witnessed a wave of violent anti-China protests - the worst unrest there for 20 years. Beijing blamed the unrest on followers of the Dalai Lama, who it said were seeking to separate Tibet from China. These latest travel restrictions highlight the authorities continued sensitivity over Tibet, says the BBC's Martin Patience in Beijing. Foreigners require special permits to visit the mountainous region - but travel agencies say they have been ordered not to allow foreign tourists into Tibet around the time of the anniversary at the end of the month. In March 2008, anti-government riots broke out in the capital Lhasa and spread to other Tibetan communities across western China. China responded to the unrest with a massive military crackdown. China said at least 18 people were killed during the unrest. Tibetan rights groups say about 140 people were killed. China does not allow foreign journalists unrestricted access to Tibet or restive areas surrounding it, making it extremely difficult to verify reports from the region. He has accused China of "cultural genocide", by seeking to change the ethnic mix of Tibet and erode Tibetan culture, language and religion with a massive influx of ethnic Han Chinese and a system of "patriotic re-education". The Dalai Lama - who fled China amid an abortive uprising against Chinese rule more than 50 years ago - is the head of Tibet's government-in-exile. He is routinely vilified by the Chinese authorities.